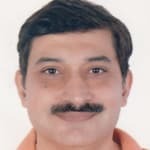 Dr. Vikas Mehra, Fellowship in Joint Replacement, MS Ortho, DNB (Orthopaedics) is an Orthopaedist in Chandigarh. He has 28 years of vast experience in the field of practice. During this tenure, he has treated numerous patients suffering from Orthopaedic problems and thus put them on the path to recovery. Orthopedics refers to a medical specialty, which focuses on the diagnosis, correction, prevention and in treating all those who suffer from skeletal deformities. The physicians specializing in this area are known as Orthopaedists. Dr. Vikas Mehra is one of the leading Orthopaedic surgeons in North India. He sees his patients in Mehra Orthopaedic Clinic. It is located at 1501, 33D, Sector 33 D, Chandigarh. He consults with his patients, Mon-Fri from 7:00 PM to 8:00 PM, on Wednesdays from 11:00 AM to 12:30 PM and on Saturdays from 12:00 PM to 4:00 PM. As an orthopaedist, Dr. Mehra specializes in being a Joint Replacement Surgeon, with special focus in Knee and Hip Replacement Surgery. Despite having 28 years of experience, he charges a fee of Rs 800 per patient at his clinic. On the other hand, he charges a fee of Rs 350 per patient for online consultation. You can easily book an appointment with the doctors online through lybrate.com. Lybrate has a nexus with top Orthopaedists in Chandigarh. You can easily find the listings of thousands of doctors in your region and check their reviews to make an informed decision. Very good. He's very skilled and is not a thief like those at Fortis. Give proper detailed treatment to disease.. Awesome experience. Fantastic doctor . He is doubtlessly the best . I am extremely happy to announce that we will be offering both knee replacement surgery with the best implants in the world for only 2.2- 2.5 lacs and the scheme would be valid till 31st December 2018. This is the beginning of our efforts to reach out to masses so as they can avail of this wonderful opportunity. Knee Replacement - Is Second Surgery Actually Required? Of all the joints in the body, the knees probably see the maximum wear and tear. In cases of severe osteoarthritis, or injuries which destroy the knee joint, a total knee replacement surgery may be advised. This procedure involves the replacement of diseased cartilage and bone in the knees with artificial materials. In cases of osteoarthritis and other such degenerative conditions, this procedure is performed only when the adjacent joints such as the hips are strong and healthy. Before the procedure, you may be advised to discontinue any blood thinning and anti-inflammatory medication. Your doctor will also conduct blood and urine tests to check for signs of anaemia, abnormal metabolism and infections. You may also be asked to lose weight if you are on the heavier side to reduce the pressure on your knees. A total knee replacement surgery is usually performed under general anaesthesia. The lower end of the femur bone or thigh bone and the upper end of the tibia or calf bone are removed and replaced with a metal shell and plastic piece respectively. In some cases, a plastic ‘button’ may also be placed on the surface of the knee cap. If the posterior cruciate ligament in intact it is left as is or it is replaced by a polyethene post to stabilise the joint and prevent the calf from slipping backwards. In most cases, a patient is discharged after 3-5 days of hospitalisation following the surgery. Post-surgery, it takes about a month for the patient to experience notable improvements. For optimal results, total knee surgery must be followed by physiotherapy and regular exercise. This helps prevent scarring and keeps the muscles strong enough to maintain joint stability. Exercising can also reduce recovery time. However, not all exercises are advisable. Avoid running, jumping, climbing stairs and contact sports which have a high risk of knee injury. Swimming is highly encouraged as it boosts endurance and muscle strength without putting any pressure on the joint. 7 Tips To Help You Take Care Post Knee Replacement! Pain and stiffness: If it hurts you a lot while you are walking or trying to climb stairs, it may be an indication for having a new joint. It has to be also noted that whether the pain is long-term. You know that you need a new joint when there you experience pain for at least 6 months. Your injured knee hampers your daily life: It is not the pain only that might be a cause to worry for. Your injured knee can hurt your entire life. It will limit your daily activities, hampering your office work and personal life. It will upset you and drive you towards depression. To get rid of all these issues, you can opt for a knee replacement surgery. Bone damage: Before taking up the surgery, you must consult your doctor. He or she will ask you to conduct X-rays and other imaging tests first. The reports will clarify whether or not you require a surgery. The reports will show that whether you are suffering from osteoarthritis or other conditions. Deformity: The surgery is needed when your knee gets severely swollen and looks deformed. Don’t forget to take your painkillers or anti-inflammatory drugs that have been prescribed to you. You must use your walking aids. However, you should remember that the aim is to slowly and gradually reducing your dependence on the aids. You should continue the knee exercises. This will reduce your stiffness. You should not sit with the legs crossed for at least six months after the operation has been done. You should avoid twisting of the knee. Wear good quality, comfortable and supportive shoes. You should often raise your leg while on the bed and apply ice pack on the knee. Can there be a case where joint replacement may not help? 1. Infection: If there is any infection in the body, you cannot take up this surgery. 2. If you have suffered from heart attack, stroke, or any diabetes related issues, then you will have complications at the time of surgery. It is also advisable to get rid of the extra kilos if you are obese to get the best results. Hip Replacement - Things You Must Keep In Mind! Hip replacement is a surgery in which a specialist doctor surgically removes an agonizing hip joint afflicted with arthritis and replaces it with a man-made joint usually produced using metal and plastic elements. It is usually done when all other treatment choices have been tried and have proven unsuccessful in providing satisfactory pain alleviation. The technique is to mitigate the pain in ahip joint, in order to make walking and other physical exercises easier. Hip replacement surgery can be performed generally or by utilizing what is called a non-obtrusive method. The primary difference between the two methodologies is the number of entry points needed for the surgery. During standard hip replacement surgery, you are given general anesthesia to relax your muscles; this will keep you from feeling any pain during the surgery or being awake during the surgery. A spinal sedative might be given to counteract pain as an add-on option. The specialist will then make a cut at the edge of the hip and move the muscles connected to the highest point of the thighbone to uncover the hip joint. Next, the ball part of the joint is taken out by cutting the thighbone with a saw. At this point a fake joint is attached to the thighbone using a material that allows them to stay intact. The specialist then readies the surface of the hipbone - evacuating any harmed ligament - and joins the substituting attachment to the hipbone. The new ball part of the thighbone is then embedded into the new joint part of the hip. The specialist then reattaches the muscles and shuts the entry point. You will probably remain in the healing facility for four to six days and may need to remain in bed with a pad between your legs to keep the new hip joint set up. A seepage tube will be set in your bladder to help you urinate without having to walk to the bathroom. Non-intrusive treatment usually starts the day after surgery and within the days you can go around with a walker or a walking stick. You will continue with the non-intrusive treatment for quite a long time which could be a number of months post the surgery. For anywhere in the range of six to twelve months after hip replacement surgery, rotating or putting pressure on the operated leg needs to be limited to a great extent. You need to likewise not cross the operated leg past the midline of the body nor turn it inwards. You cannot twist the hip past ninety degrees. This includes both twisting forward at the abdomen and crouching. Your physical advisor will tell you the methods and equipment that will help you comply with the above rules and precautionary measures while performing every day exercises. 6 Foods That Are Must For Healthy Bones! A healthy diet is not only important for that slick waist line, but it also keeps your bones healthy. Two of the most important nutrients needed for healthy bones are Calcium and Vitamin D. Calcium helps in strengthening your bones while Vitamin D facilitates calcium absorption in the body. If the bones are not healthy, it can lead to bone disorders such as osteoporosis and rickets. Milk: If you think milk is just for kids, think again. Milk is one of the best sources of protein and calcium; in fact it contains 30% of calcium as per RDA. So yes! Drop all inhibitions and drink that glass of warm milk to keep your bones healthy. Cheese: Another milk based product, cheese is also rich in protein and calcium. You need to make sure that the cheese you consume is the fat free version in order to restrict calorie intake. Sardines: If you are planning on getting a fish sandwich for lunch, then you are on the right track. Sardines are not only rich in Omega 3 Fatty acids, but they also contain calcium and Vitamin D is high amounts. Eggs: Don’t fear the egg yolk and dispose it off. Not so fast now! Egg yolk contains Vitamin D, an essential nutrient that facilitates calcium absorption in the body. Eggs are also one of the best super foods as they are a powerhouse of various nutrients. Spinach: Remember Popeye, the cartoon sailor whose muscular frame was attributed to spinach. Now let’s get down to the facts. Spinach contains calcium, fiber and iron – all very essential for your body. Consuming spinach regularly is one ‘go green’ way to keep your bones healthy. Bone & Joint Health - Ways You Can Keep Them Healthy! The bones and joints in your body provide the basic framework on which all movement takes place. The joints are even more important as they act like hinge for the various types of movement that we require. However, these are the first to be affected due to muscle or bone disorders and thus limit your mobility. In most cases, these problems are caused by lifestyle disorders which can be easily corrected by making a few changes. Lose weight: Not just full-fledged obesity, but being overweight and also slightly chubby may not be in the best interest of your joints. The heavier you are, the more load your joints have to carry and thus, this may affect their health over time. Losing weight and being close to your ideal body weight will allow your joints to be under less stress thus keeping them healthy for longer. Start moving and stay in motion: One of the greatest evils of the modern lifestyle is its sedentary nature. While at work or at home, you probably spend far less time moving or walking than sitting or lying down. It is important to move and keep the joints functional. The more functional they are, the stronger they will be. Vitamin D for your bones: All joints in your body are made up of bones; and for healthy joints, you need healthy bones. Vitamin D and calcium are thus important ingredients required to make your bones strong. Dairy products such as milk or leafy green vegetables can easily satisfy your requirements. However if you can’t have dairy, then your doctor could prescribe calcium supplements to you. Don’t overwork or strain your joints: While it is necessary to stay in motion to ensure that your joints remain strong, overusing those joints could damage them. It is important to know your limits and also slowly push and improve on yourself rather than trying to make quick leaps. Start off with lower impact exercises such as cycling, walking or swimming and gradually go to more intense workouts when your joints are stronger. Always warm up: Before you do any kind of exercise, warm up slowly so that your joints are loose enough and lubricated to take the strain you put on them; no matter how light the exercises are. Stretching and warm up exercises are a must as they help you minimize long term damage to your joints. Diet: Diet is one of the most important aspects for overall health and hence it is very important in the case of joints as well. Certain types of foods rich in Omega-3 fatty acids are very good for your joints as they help reduce inflammation, such as some varieties of fish. On the other hand, certain types of food can cause inflammation and may even lead to long term problems. Tips For Fast & Less Painful Recovery Post Surgery! Installation of preventive fall equipment is necessary to ensure that the patient does not sustain further injuries post-surgery. Knee surgery recovery can be very time consuming in which case, the patient may experience high levels of anxiety, and depression. A close friend should be available in times of emotional need to reduce negative feelings. Crutches and other supportive objects should perpetually be in close proximity to the patient as it can be very difficult for patients to reach their close destination without the help of these necessities when in need. It is a prerequisite for the families and loved ones of the patients to show emotional support as feelings of isolation can cause further pain to the patient. Along with that, the patient should keep a positive attitude during the course of their bed-rest time. If one keeps these tips noted, recovery can be a less arduous condition. Consult an Expert & get answers to your questions!